The Mozilla Developer News weblog is carrying an announcement that the final version of Mozilla Firefox 3 will be released on Tuesday 17th June. "After more than 34 months of active development, and with the contributions of thousands, we're proud to announce that we're ready," the message says. "It is our expectation to ship Firefox 3 this upcoming Tuesday, June 17th." It should be noted that there is still a small chance that a show-stopper bug could delay the release. However, barring any unforeseen disasters, Firefox fans can now circle next Tuesday in their calendars as Firefox Download Day when millions of users will attempt to set the Guinness World Record for the most software downloads in 24 hours. Anyone planning to host a Mozilla Party on the actual Firefox 3 launch day now also knows which date to target. The third and final release candidate of Firefox 3 was made available earlier today with a workaround for a Mac OS X bug. 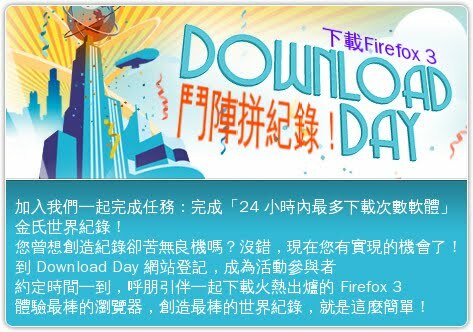 If you prefer to no longer receive emails from Mozilla concerning Download Day, you may unsubscribe here.